Choose potatoes that are firm and free of sprouts, green skin, or spots. Some of the most popular types of the many varieties of potatoes are described below. This is the most popular potato in the United States. It is also known as the Idaho or baking potato. Most are grown in the Northwest, and they are available year-round. These potatoes are high in starch and are characterized by netted brown skin and white flesh. Russets are light and fluffy when cooked, making them ideal for baking and mashing. They are good for frying and roasting, too. Round whites are grown and used most often in the eastern United States. They are available year-round. Round whites are medium in starch level and have smooth, light tan skin with white flesh. These potatoes are creamy in texture and hold their shape well after cooking. Regarded as an all-purpose potato, round whites are very versatile and work well in just about every potato preparation. These are grown primarily in California and are most readily available spring through summer. Long whites are oval-shaped, medium in starch level, and have thin, light tan skin. They have a firm, creamy, almost waxy texture when cooked, and hold their shape well. These all-purpose potatoes are very versatile, and work well in just about every potato preparation. These potatoes are available mostly in late summer and early fall. They are easy to recognize with their red skin and white flesh. 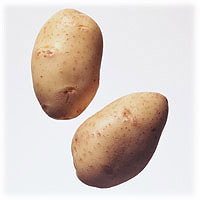 Red potatoes have a firm, smooth, and moist texture, making them well suited for salads, roasting, boiling and steaming. They are often referred to as “new potatoes”; however, technically, “new” refers to any variety of potato that is harvested when its skin is reddish, before reaching maturity. These potatoes are very popular in Europe and increasingly popular in the United States, although they are still not grown in large quantities. Yukon gold is a variety of yellow-flesh potato available in late summer and early fall. These potatoes have a dense, creamy texture. With their golden color, you can be fooled into thinking that they are already buttered. They are a good choice for mashed potatoes. These potatoes originated in South America and are not widely cultivated in the United States. Blue and purple potatoes are most commonly available in the fall. In the United States, they are often seen on the snack shelves of natural foods and grocery stores as chips. These relatively uncommon potatoes have a subtle nutty flavor and flesh that ranges in hue from dark blue or lavender to white. Microwaving preserves the color the best, but steaming and baking also work well. Potatoes are sold fresh, dehydrated, canned, frozen (mostly as French fries or hash browns), and, of course, there’s the familiar potato chip. Potato flour, also known as potato starch, is also available, and can be used as a binder in meat or vegetable patties. Dehydrated potato flakes and granules are used most often to make mashed potatoes. Some products require the addition of water, milk, and butter; others only require the addition of water. Dehydrated shredded, sliced, and diced potatoes are also available. These can be found in packaged convenience potato products, such as potatoes au gratin mixes.